COMPATIBLE WITH IPHONE 7, IPHONE 6S, IPHONE 6, IPHONE 5, IPHONE SE, GALAXY S6, GALAXY S6 EDGE, GALAXY S7 and OTHER DEVICES WITH A SLIM CASE. Supports phones with cases measuring 5.62 X 3.12 X 0.4 inches or less. Gear Beast Slim Case Compatible Armbands are designed to fit your device while using a slim protective case* or bumper case. 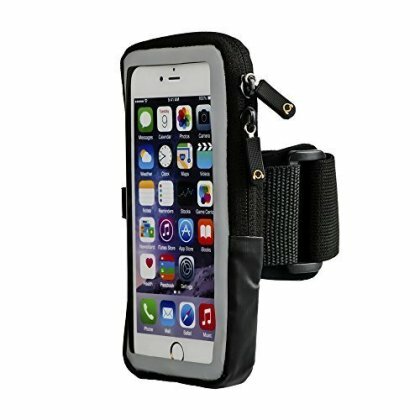 *For larger, bulky protective cases from Otterbox, Lifeproof and others check out our standard Case Compatible line of armbands. PERFORMANCE AND COMFORT. Constructed of high quality sweat resistant neoprene, this armband also features a newly designed elastic arm strap and a durable NON-PINCH BUCKLE to ensure a comfortable fit that flexes with your arm and will not pinch or constrict movement. Designed to provide comfort and convenience to athletes during workouts this armband is also great for travel. In addition, the elastic material used flexes with your bicep to provide improved performance while WEIGHTLIFTING. ENHANCED TOUCHSCREEN SENSITIVITY FOR EASY PHONE OPERATION. The Gear Beast Slim Case Compatible Armband is designed for every athlete or beginner who is seeking a higher performance running armband for their smartphone or iPod MP3 player. The ultra-thin, but tough, 0.3 mm screen protector allows you to easily access your music and apps. KEEP YOUR PHONE AND VALUABLES SAFE AND SECURE. Gear Beast Armbands are made for convenience. The Interior Valuables Pocket conveniently transports your phone along with your ID, money, credit cards, and keys while running, hiking, walking or working out. MADE FOR EVERY TYPE OF ATHLETE. This armband comfortably fits arms 8 to 20 inches. The improved strap design keeps the armband in place even during the most rigorous activities. Armband also features a REFLECTIVE SAFETY BAND that increases visibility during low light and nighttime activities. Be Seen and Be Safe!